The Defense Department has clear orders from President Donald J. Trump “to build a stronger military, take care of our men and women, and excel in our business operations,” Deputy Defense Secretary Patrick M. Shanahan said yesterday. 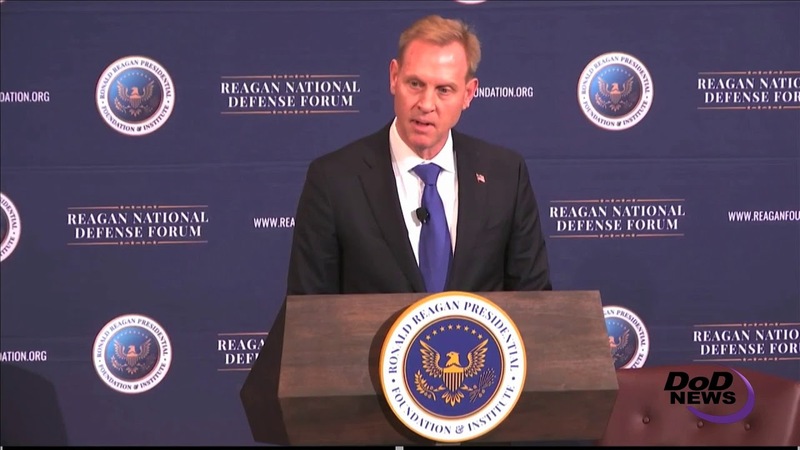 Shanahan was the closing speaker at the Reagan National Defense Forum in Simi Valley, California, and he spoke how the department is putting the president’s orders into effect. The deputy secretary has been on the job for just under five months, and said he is most concerned with managing business practices to find money to make the military more lethal. He noted that the U.S. military also faced obstacles to readiness and modernization in the years immediately preceding World War II. “While military leaders sought stable funding, political tensions and budgetary pressures stymied readiness efforts until the Second World War arrived on our doorstep,” he said. Today, artificial constraints once again hold the national defense hostage, Shanahan said. “From budget stresses like continuing resolutions and Budget Control Act caps to disagreements in Congress that affect timely decision-making, right now we have time -- one of our most precious resources. But we lack the stable budget needed to prepare for future fights,” he said. The department must get away from risk management and seize opportunities to remain competitive. “A risk-balanced, opportunity driven approach with spark innovation and help protect our hard-earned culture of excellence from the unintended distortion of instability,” he said. Long-term readiness and modernization will be embedded into the National Defense Strategy, the deputy secretary said. “We are building alignment across the department, the interagency, with industry and other partners and allies,” he said. “We view all these efforts through the critical lenses of lethality and affordability. After all, we must remember the department’s primary purpose is to be as lethal as possible, ensuring our diplomats speak from a position of strength. “This is only possible when our enemies know with certainty that we are ready to fight and win our wars, and our allies know we stand steady alongside them,” he continued.